My next long holiday will be a less hectic one for sure. But no regrets about all the last minute arrangements made! I just got off the plane earlier this afternoon after a quick 4 day stay in Myanmar, Yangon. We didn’t get to visit the touristy bits but that’s okay 🙂 Met and talked to lots of Burmese and wow, I really love the energy of this city! The facades might not be the prettiest or the cleanest but honestly all this can easily change within 10-20 years. What matters are the human resources and the Burmese exude lots of potential. The biggest caveat to greater prosperity for the country is their political situation. To me there are two big concerns. One, the military is still running the show and while there are encouraging signs of tolerance of different opinions (we saw pickups with National League of Democracy banners driving around and speaking over loudspeakers), there is still this underlying tension. Anything can change overnight. Nothing is for sure. Two, I fear that the country would not be able to handle the banes of capitalism now that they are ‘opening up’. This would involve more sophisticated legal frameworks and good leadership from the government. There’s nothing much to be said about Tsujiri’s Parfaits except that they are…. all delicious. The green tea soft serve is a winner in my books- creamy, the green tea is extremely strong but the bitterness is just right, not rough on the palate. The red bean and cornflakes all work well with this soft serve. Oh guess I’ll just have to stick to their original parfait…. 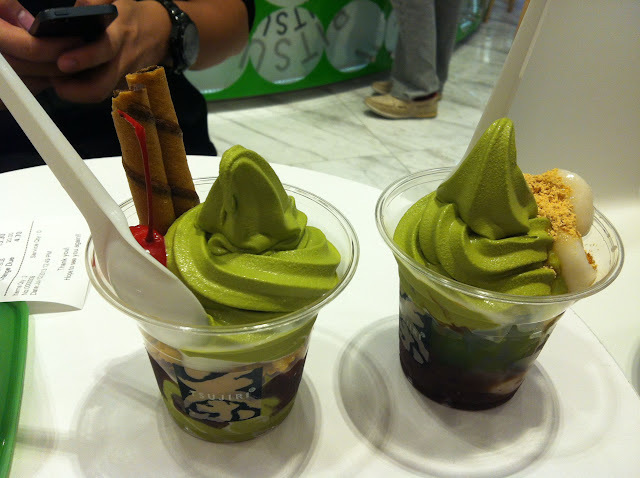 or their drinks with matcha soft serve!